One of the worst things that can happen to a designer is to sit in front of your laptop or a blank sheet of drawing paper and have nothing creative or inspirational happen. I mean nothing, nada, zip. Not a creative thought whatsoever. Believe me this is a place I have visited many times and I am sure you have too. One of the great challenges a creative person faces is to regularly come up with designs that are fresh, new, and exciting. Not to mention original. 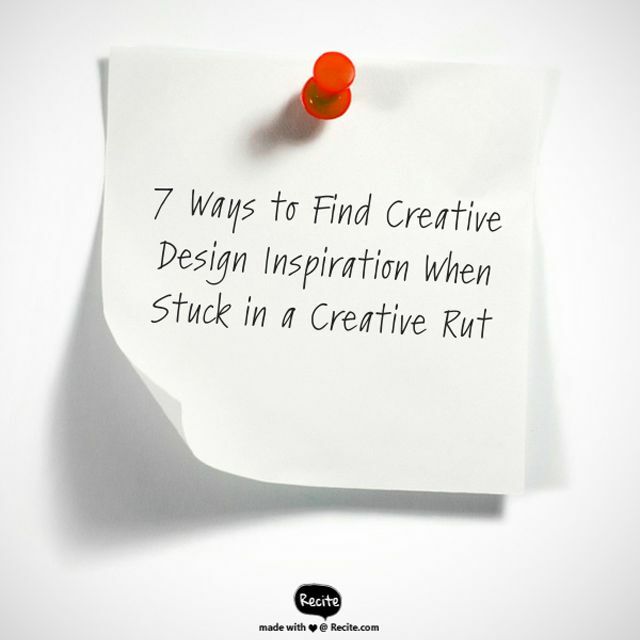 When those creative thoughts just don’t come, there are several tricks you can implement to get out of that creative rut and find inspiration. These seven tips have always worked for me and I know they will help you too. Let's cover the obvious places to find inspiration first! As a crafter the first place I go to get my creative juices flowing is Pinterest. There are millions of beautiful photos. If I am not careful I can spend hours looking at them losing complete track of time, but the site is totally worth it! Pinterest has got to be one the worlds greatest inventions ever for those looking to get their creative mojo back. YouTube is also a source for ideas. You can find craft tutorials galore! If you want to know what is new and trendy for the craft world, check out the CHA Craft and Hobby Association trade show videos. They are a great resource for those of us that just can’t afford to participate in the trade show but still want to know what the craft trends are for the coming year. Deviantart.com is probably one of the longest running websites for artistic types to participate online. You can find both professional and amateur level artwork. It is always worth a look. I especially like the free downloads offered by artists. I have gotten many Photoshop brushes, Photoshop patterns, vector clip art and just plain old creative inspiration from the site. Even though the downloads are free, you should always be careful to check the copyright right rules first and respect the wishes of the artist. Believe it or not meditation is a great way to center yourself and open up to new ideas. Meditation isn’t hard. All you have to do is set aside twenty minutes per day. Find a quite place where you will not be disturbed. Sit upright in a chair and concentrate on your breathing. Let your thoughts go. The idea is to let your mind become still. It is not easy at first to let go of thoughts, but becomes easier with practice. Meditation is good for your health and spirit. I love it and believe it promotes creativity. If you want to learn more about meditation click here. Sometimes one of the best things you can do when you are creatively challenged is to just step away and stop working. Go outside for a walk and enjoy nature. You will be amazed that when you are relaxed and in a different environment the creative answers or solutions to your problems will just pop into your mind. No mental forcing is needed whatsoever. Artistic people often work in solitary environments. It is just part of the job. You will be amazed how networking with like minded people can help bring fresh ideas and inspiration to you. I myself meet once a week with a networking support group and look forward to it. I can talk about problems that I am having and my group will often present advice from different perspectives that I had never even considered before. The support is amazing, and there is power in a group. The social aspect is nice too. You will find people in a networking group will often become friends, and are fun to be around. Music soothes the soul and stimulates creativity. Pop on some head phones while working and listen to your favorite music. It can be upbeat or quiet new age type music. Whatever makes you feel good and gets you inspired. Pandora is one of my favorites to listen to when working. It is free and you can set up channels with your favorite types of music. This is similar to tip number 3. Step away from your work and get inspired somewhere else. I like to go to art and craft fairs, trendy art and gift shops,museums and book stores to get inspired. You will find your creative juices flowing while looking other peoples work. I keep a small spiral notebook in my purse so I can jot down inspirational ideas when they come to me. I find that if I don’t write down the ideas as soon as they come to me, I will forget and the creative idea will be lost forever. These ideas have helped me on my artistic journey and I hope that they may help you on yours too. Now go out there and dazzle the world with your creativity!